On Monday evening the Red Dot Award: Product Design 2013 jat its climax: More than 1,200 international guests celebrated the winners of the worldwide renowned competition in the Aalto theatre. The Red Dot gala took place for the 20th time on the 1st of July in the Essen opera house. The Design Centre North-Rhine Westphalia marks internationally exceptional product designs with its famous dot since 1955. Manufacturers and designers of different industrial branches present their products in 19 categories surrounding the desired honour. Designers, architects and companies out of 54 countries presented nearly 4,700 of their best products in 19 different categories. A total of 1,065 Red Dots were given for excellent product design and 205 honourable mentions were given, honouring succeeded details solutions. 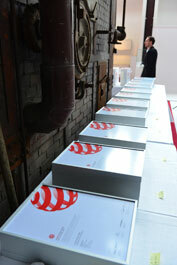 53 happy awarded products received the Red Dot: Best of the Best, the greatest award of the whole competition. 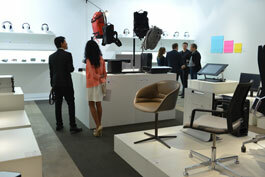 The composition of the high grade jury, the core of the Red Dot Award Product Design, changes every year. 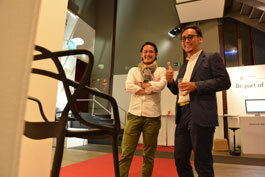 Recognized international design experts came together again, among them e.g. Mårten Claesson, Stefan Diez or Danny Venlet. The jury evaluated the winner products according to criteria such as innovation, functionality, formal quality, ergonomics, longevity or ecological compatibility.